Don’t always go for the cheapest ticket. Although it may seem tempting, some bus operators have a poor safety record and may offer cheaper fares for this reason. Do some research on reliable operators within each country before booking anything. This is more important in certain countries. 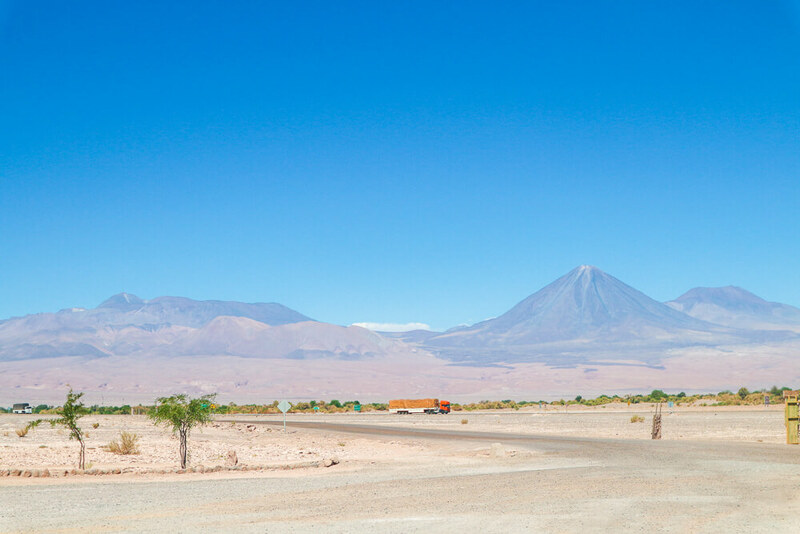 Peru in particular has a reputation for poor driving standards and crashes are frequent. Even with the safest of operators, you may find the driving fast and erratic. Some companies ensure drivers are only at the wheel for 4-5 hours at a time, to eliminate any danger of the drivers becoming tired. It really is worth spending the extra money to ensure you get to your destination safely. Even on 12+ hour journeys, stopping for food is a rarity. Make sure to bring plenty of snacks or risk wishing you had. Some buses will advertise food, but it’s rarely filling. The only company to provide us with any substantial food was Cruz Del Sur in Peru. If you get lucky and make a stop, ask if you have time to get some food. The drivers never give any indication of how long a stop will be unless you specifically ask. Otherwise you may end up waiting for half an hour wondering whether you have time to go grab a snack. If you do have time to get food at a stop, be warned that the menu can be quite limited. In our experience most items cannot be prepared in time before the bus leaves again, so if you need to eat you’ll have to take what you can get. We cannot put enough emphasis on bringing your own food – it’s cheaper and you’ll have more choice. For the most part, buses in South America do have toilets on board, with the main exception being Ecuador. Unfortunately, in most cases the toilets are unclean. They are usable if necessary, but if you can hold off until the end of your journey we’d recommend it. Always carry some extra toilet roll around with you when you’re on a journey. That way if you stop somewhere that is out of toilet roll you’ll still be able to go about your business with no problems. Unfortunately, toilet stops do seem to be sporadic. Some operators will make stops, but some expect you to either put up or shut up. We’d recommend trying to get a seat away from the toilet if there’s one free, or you’ll be in for a smelly ride. While food and toilet stops are rare, don’t be surprised to spend long periods of time stopped in seemingly random places. Sometimes drivers pull over without warning, and you won’t get back on the road for an annoyingly long period of time. Sometimes these stops are quick, but other times it can be over half an hour. You may be able to get off the bus in search of food or a toilet, but check with your driver before doing this. If you’re planning a lot of bus travel in South America, expect this to be a running theme. Buses are consistently late. You can be waiting for hours hoping for your bus to turn up, with no real indication of when it will. 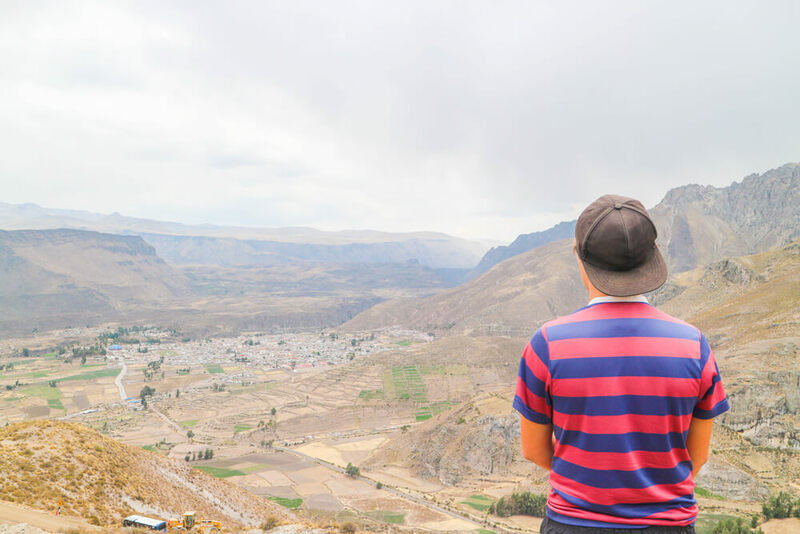 Only Cruz Del Sur in Peru were consistently on time in our experience. With the likelihood of getting stuck in some traffic, especially in inner cities, you’ll rarely arrive at the scheduled time. As long as you prepare to be late, this shouldn’t be an issue. If your bus wasn’t late setting off, there’s plenty of other ways your arrival can be delayed! 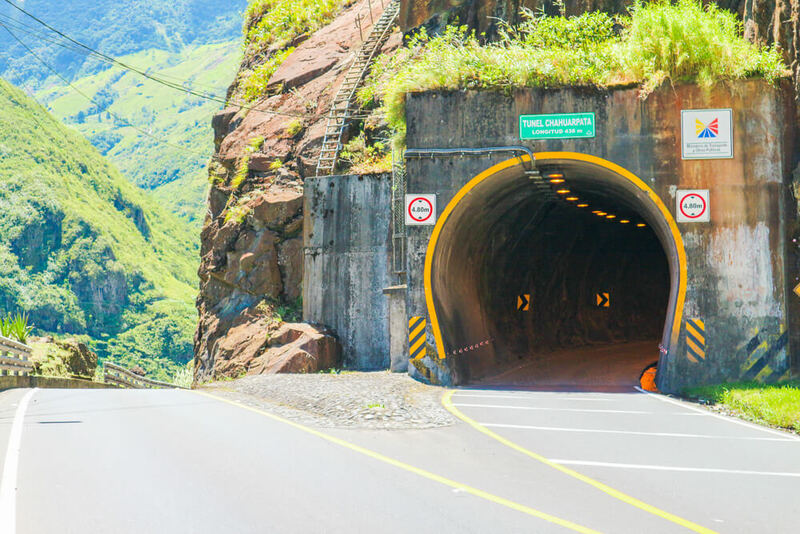 Some routes involve a lot of mountain driving – not for the faint hearted. With steep drops next to the road, and driving uphill, your journey may take a lot longer than expected. Even if the distance between two places seems quite small on a map, it can end up taking hours more than expected if you have to take a mountainous road. While this can be frustrating, these journeys do offer breath-taking views – so it isn’t all bad! It is common to have your journey interrupted for the police to conduct checks. If this happens, you’ll need your passport to prove you are legally allowed to be in the country. They may also ask to check your bag. Depending on how thoroughly the police are conducting checks, or if anyone is suspected of wrongdoing, your journey may end up delayed an hour or more. With most journeys delayed already, this is the last thing you need, but it is unfortunately relatively common. These stops are more likely to happen near country borders, but are possible anywhere at any time. It’s common for films to be played during your journeys. You may be lucky enough to have English subtitles but this is rare. Sometimes the films are played loudly, so sit near the back and try and avoid speakers if you don’t want to watch. More often than not, the films are of a good quality – we even had the latest Star Wars on one journey. That being said, we also had to endure some obscure films we had never heard of that we certainly won’t be rushing to watch again! It’s definitely a hit and miss but if you have nothing to do and can understand Spanish it may help pass the time. Bus companies in South America consistently seem to advertise an on board Wifi service. Do not trust this. Almost every company we travelled with insisted they had on board Wifi, but of over 7,500km travelled this service only worked once. Even then it worked exclusively for facebook and whatsapp. This is by no means essential, but some operators will try to charge you more for this service, when in reality it won’t work at all. If you have anything essential to do online, get it done before you travel. While you may think working air conditioning would be a blessing, in some cases it means you’ll be freezing. The other side of this is that if it doesn’t work, you’ll be dripping in sweat for the whole trip. It really can go either way. On some trips, the air conditioning would cut out half way, leaving hours to suffer high temperatures in a small space. If you can open the windows, it may not be enough to make a real difference to the inside temperature. Make sure to wear light clothing but have some warmer clothes easily accessible – that way you’re prepared for either outcome. When buying a ticket for almost any journey, regardless of country, you will be issued a seat number. In some cases, you may be asked to select your seat number from a seating plan. People take their seat number quite seriously, and on a number of our early trips we were asked to move as we were in the wrong seat. We quickly figured out we were best off asking people to move if they were in our seats, even if other seats were available. We recommend you do the same. That way you save yourself the time and hassle of moving all your stuff to another seat if you end up sat in someone else’s. Keep in mind some of the other points if you do have the choice to select your seat. Try to avoid a seat near the toilet if possible, and if you’re planning on sleeping you’ll want to be as far as possible from any TVs. Due to the long distances and lack of things to do, a lot of people spend the majority of their journey sleeping. All the buses we travelled on had reclining seats, which pretty much everyone reclines as far as possible. If you’re not trying to sleep and want to sit up straight, this means you’ll have a severe lack of space. The best way to avoid this is to try and get a seat at the front of the bus – that way no one will be in front of you. The extra space makes a huge difference over the course of several hours. The further in advance you book your ticket, the more likely you’ll be able to get one of these seats. Just ask at the time of booking. Getting your tickets in advance is advisable, even if it’s just a day before. In some countries this is possible to do online, depending on the operator. If you’re travelling during peak season, it is best to book as soon as you know your travel dates. This saves the risk of seats selling out and you having to change plans. With booking online, you are sometimes able to book VIP seats for the same price as standard seating. This gives you extra legroom and comfier seats. Booking online can also save unnecessary trips to the bus station – which in some cases may not be at a central location. Depending on where you’re staying, you may find the bus station is quite some distance away. This is especially the case in bigger cities such as Lima, Santiago and Buenos Aires. As a result you’ll most likely want to get a taxi to your accommodation. For smaller towns, such as Mancora and Banos, the bus stations are more central, giving you the option of walking. You also need to be aware that some bus companies have their own stations, and so check exactly where you will depart from when buying your ticket. Cruz Del Sur for example often have their own stations. We met a surprising number of people who turned up to the wrong station and ended up having to pay again to travel on the next available bus. If you’re only planning on staying in a place one night, our advice is to find accommodation close to the bus station. This saves extra transport costs getting there and back. Arriving at your destination after a 12 hour journey knowing your accommodation is across the road is a great feeling. The last thing you want is to spend another half an hour waiting to get there, cramped in the back of a taxi with all your things. One final tip regarding stations is that some have a small exit fee for using the station. To find out whether this is the case, ask when buying your ticket. They’ll be able to inform you if there’s a charge and where to pay if necessary. 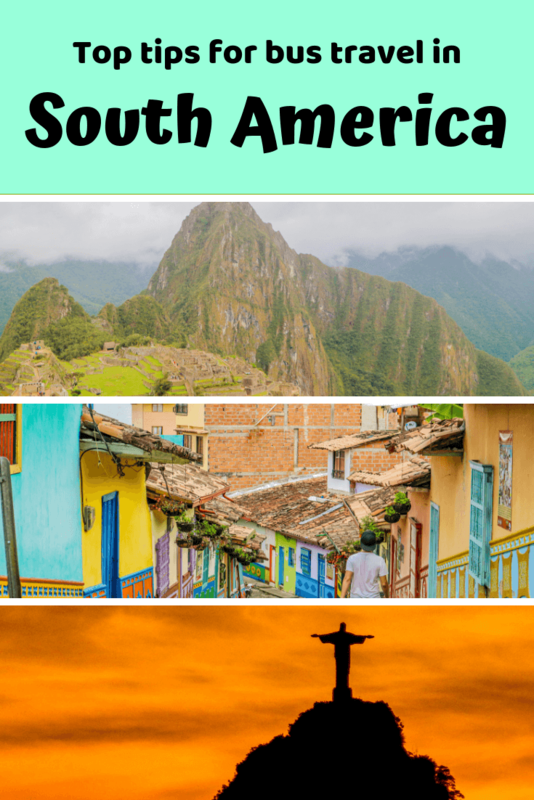 Make sure to check out the 11 things you need to know before travelling South America. 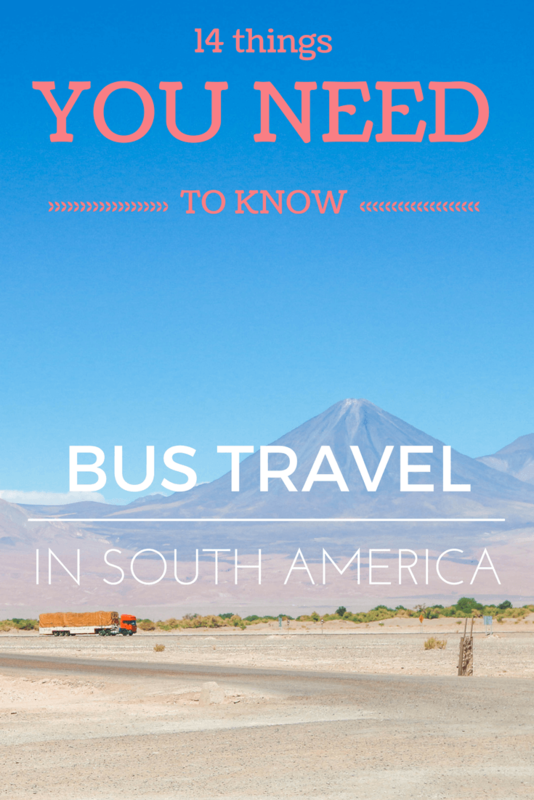 Like these tips for bus travel in South America? Pin them! iI loved travelling by Bus when I was single, you get to experience different scenes as you go by. But not anymore, I have kids now and I cant imagine keeping them entertained for that long. Plus the stress of sitting throughout. Nice post. Thank you for this great article! It is very useful. I was wondering, could you maybe list the bus companies you have tried and recommend and, on the other hand, the companies you think it is better to avoid (if any)? Thank you! We’re glad you found the article useful – thank you! Colombia- Bolivariano were really good and safe when we used them, but we only travelled by bus from Cali to Ipiales. 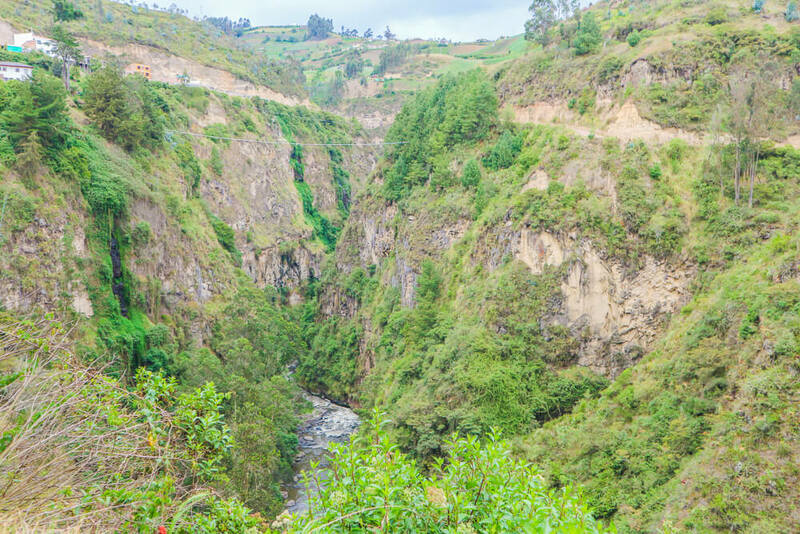 Ecuador- The buses here aren’t as organised specifically by company and so we never used a specific company. All were relatively good, and had a screen playing movies but most buses here don’t have a toilet. 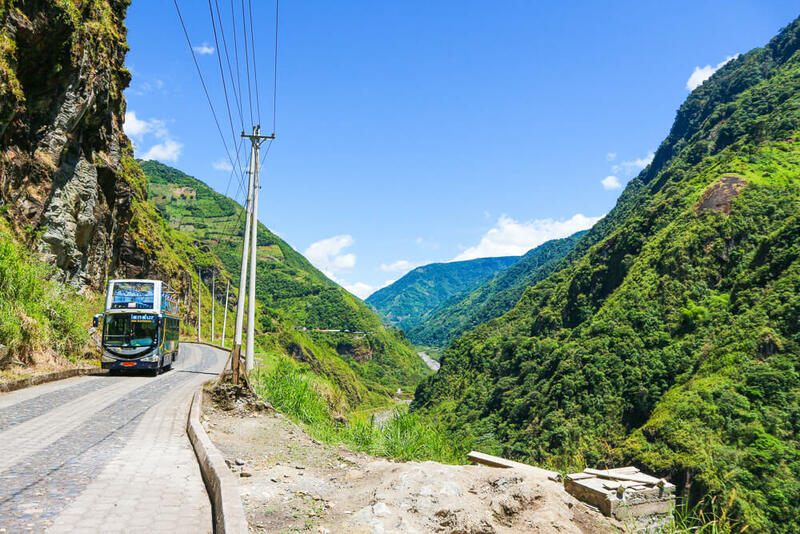 Peru- We would recommend avoiding ITTSA bus. We booked with them from Mancora to Chiclayo and despite being told the bus was a good standard it was not. Many seats were broken, the bus hadn’t been cleaned and the toilets were disgusting. Luckily in Peru Cruz Del Sur operate and they offer amazing service. You get meals, comfy seats and your own personal TV screen to pick movies etc. They’re really safe and we never had any issues – just make sure to check where you depart from when buying a ticket as they sometimes have their own terminals. Oltursa were also safe and reliable when we used them. Chile- Turbus are a pretty good company to go with. You can book online easily, unlike most operators. They offer a safe and reliable service, however, on long journeys their snacks are very minimal. When you stop for food there may not be enough time to get something substantial so plan ahead! you’re welcome! Hope the information is useful and you have a great trip! Very interesting and informative post! Travelling by bus in South America sounds a lot like in India! Hehe.. looks like a beautiful country but the bus rides sound painful. I guess you have to put up with certain things if you have to make the most of your journey! Thank you and yeah it is similar to India in a way! Really great advice here: thank you! 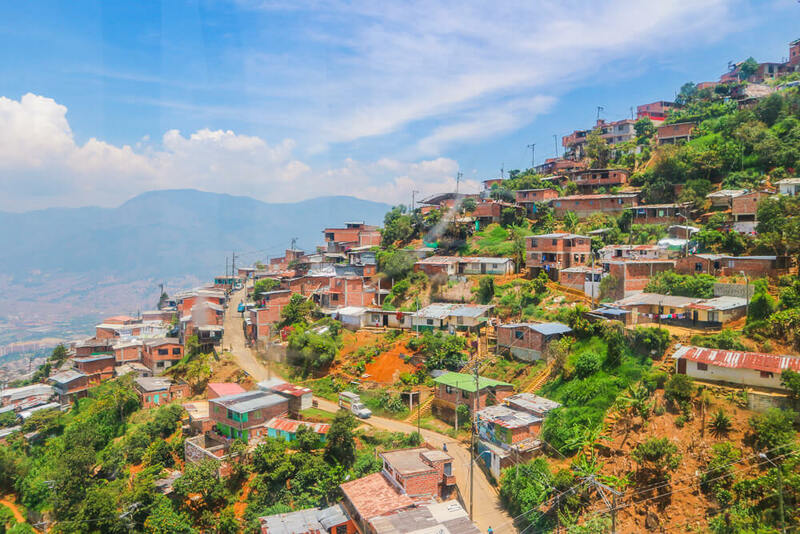 I tend to rent a car and drive myself when I can afford it, but I’ve never traveled in Latin America that way so I can’t speak from experience. Thank you – glad you like the advice and we appreciate the comment! We love to rent a car when we can too – the freedom of working to your own schedule is great! That being said we decided to travel by bus due to the sometimes erratic driving of locals in South America, as well as some bad road conditions. It seemed the safer option for us, especially considering our Spanish is limited if we did run into any problems. Hello there, finally I found some information about traveling by bus in South America, now I can have a better idea of what I should expect from a journey like this. Glad the information was useful! I giggled a bit at the wifi lie because even in the states, claims are made for reliable wifi which isn’t true. I also think bringing a roll of toilet paper is essential but I always forget it! Lucky we have each other to remind each other! Very helpful tips, thank you! How did you find out which operators were dodgy in terms of safety standards in each country? Thank you! We did a lot of googling with which bus companies were best in the particular countries. Also asked around with people we met if they had any bad/good experiences with particular bus companies! Ones for Peru we can recommend are Cruz del Sur and Oltursa.